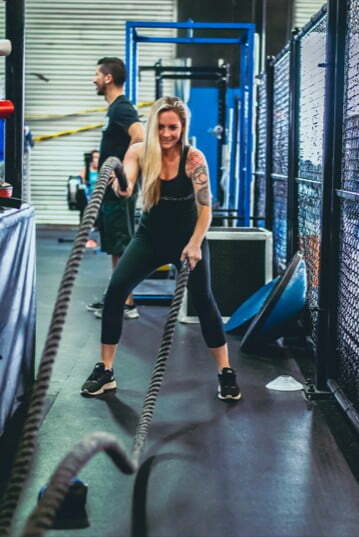 Functional fitness training is the science of incorporating multiple muscles and joints simultaneously in dynamic movement, as is typical during everyday activities at work or play, such as lifting a child from a car seat, changing a flat tire, or running to catch a taxi with a 10 lb. suitcase dangling from one arm, while waving frantically with the other. You might wonder why you are able to bench press large amounts of weight at the gym, or perform multiple squats and lunges without injury, but injure yourself removing your toddler from the car seat. That’s because your body has not been trained to correctly incorporate multiple joints and muscles during this type of every day activity, which involves both upper and lower muscle groups, spinal flexion/extension, and the joints in the wrists, elbows, shoulders, knees, hips, and ankles. Functional fitness trains your body to perform these type of tasks in a safe and effective manner, minimizing the risk of injury. There are usually a variety of props employed in Functional Fitness classes to aid in the process, such as hand weights, kettle bells, fitness balls, benches, and more. The key to good functional fitness is based in the science of biomechanics. Rather than isolating muscle groups as is done when using exercise equipment in gyms, Functional Fitness trains muscle groups to work together. This total body workout is designed to teach correct body alignment and form while performing exercises that simulate everyday commonly performed tasks. It improves muscle strength, core strength, range-of-motion, flexibility, balance and agility. The plyometric and cardiovascular aspect of this workout format also helps improve lung function, heart rate, and blood pressure. Because all these physical attributes are integral to making daily activities easier, there is an increased sense of well-being due to improvement in overall health and quality of life. Functional exercises tend to be multi-joint, multi-muscle exercises. Instead of only moving the elbows, for example, a functional exercise might involve the elbows, shoulders, spine, hips, knees and ankles. This type of training, properly applied, can make everyday activities easier, reduce your risk of injury and improve your quality of life. Should I add functional fitness to my work out regimen? Adding Functional Fitness training to your workout regimen might be one of the best decisions you can make toward improving your life through an increased sense of energy and vitality. No matter what your age, current physical fitness level, or lifestyle, this is a workout that anyone can participate in and see improvement in functionality in a very short period of time. Even those who are involved athletically in specific sports or recreational activities, such as bicycling, surfing, skateboard riding, etc., can benefit from working their body in a different modality, which changes the way muscles and joints are being utilized. For senior citizens, the benefits are equally as beneficial, especially as loss of balance, core stability, muscle mass, and mobility are diminished as we age. Functional Fitness can slow down these effects of aging, creating a greater sense of independence and self-esteem. All you need to get started is a desire to improve your overall health and fitness level in a way that serves you in maximizing the enjoyment and quality of your life. Bring a hand towel, bottled water, remember to eat some protein before and after your workout, and stay hydrated during class. We’ll take care of the rest. Quality, yet affordable, fitness in Escondido and San Marcos areas. Call now for a TRIAL CLASS with NO ENROLLMENT FEE!